The rapper appears to have been taken into custody while performing. 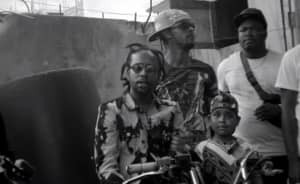 Instagram footage from a recent performance in Antigua appears to show the singer Popcaan getting into a dispute with a police officer. Initially the singer can be seen coming to the aid of a stage crasher who is attempting to extricate himself from the policeman's grasp. But when the fan wriggles free, the officer does not appreciate Popcaan's intervention, and he gives the singer a shove. Popcaan bats away the policeman's hand, which seems to make the officer angrier. The Gleaner reports that Popcaan was subsequently taken into custody. A representative for the singer was not immediately available for comment.